The Jalsa Salana [Annual Convention] UK is InShaAllah going to commence on the coming Friday. By the Grace of Allah the Almighty, guests have already started arriving from other countries to participate in the Jalsa. In addition to Ahmadis, who come to benefit from the blessings of Jalsa, the guests of Jalsa now also consist of non-Ahmadis and non-Muslims, who come from not only Great Britain but also from various other countries. These attendees include Government representatives or public officials of some countries and influential people from academia. Likewise, the number of people related to press and media has now also started to increase. All these attendees, who are from outside [the Community], observe everything very closely and are usually impressed. Thus, during these days, our volunteers consisting of men, women, girls, boys and children serve to do silent tabligh and through the press, Ahmadiyyat is introduced across the length and the breadth of the world on a very broad scale. Thus, volunteer workers have a huge role and wherever or in whatever capacity the workers are engaged, they have their own special significance. This significance should be borne in mind by everyone, from a regular assistant to an officer. Actions and behaviour of every worker have an impact on those observers from outside the Community. Thus, we should remember this and we should push ourselves at times, if ever such circumstances arise, to endeavour to provide comfort and ease for the guest. Furthermore, I say this to the supervisors in every department that if their conduct is gentle, their morals are good, they are patient and have the courage to tolerate unpleasant words, subsequently, their representatives and assistants will also demonstrate and manifest such conduct with the guests and will establish excellent examples of hospitality. However, if the supervisors have a harsh demeanour, have a rough tone, are unable to listen attentively and tolerate, their representatives and assistants will also demonstrate such conduct. Thus, in order to establish the highest standards of hospitality, the supervisors in every department should continuously assess themselves and endeavour to elevate their modesty and humbleness to the highest standard. As I mentioned, there are not merely a couple of departments, which fall under the category of hospitality. Rather, every department is a department of hospitality at Jalsa Salana. Those distributing food, who directly interact with guests, I always remind them that at the time of distributing the food and putting it into plates, they should also consider the preference of the guest. Even though this takes a lot of time and is a difficult task, nevertheless, try to be as mindful of this as possible. Furthermore, if there is no other option then excuse yourself in a most handsome manner, rather than doing so harshly, which hurts the other person’s feelings. Whilst drawing attention to this and to making analysis, the Promised Messiah (as) on one occasion stated that the supervisor for the Langar must continuously examine the needs of the guests, but because he is one person, at times he may not be able to oversee everything. Some things may escape his attention, therefore another person should be assigned to remind him and the best way to remind is for the in-charge to appoint someone who will examine where there are shortcomings. Both the rich and the poor should be entertained in the same way. As I have said that non-Ahmadi guests or press representatives participate in our Jalsa and they often assess our behaviour. Therefore, the moral standard of the workers in every department must be very high indeed. Then on one occasion the Promised Messiah (as) stated: “According to my belief if a guest comes and the situation leads to him hurling insults and abuse then we should tolerate this.” What instructions did the Holy Prophet (sa) give us regarding the importance of guests and honouring them? There is a narration that the Holy Prophet (sa) said in order to believe in God and the hereafter three things are necessary – to say a good word or remain silent, to respect your neighbour and the third is to honour your guests. 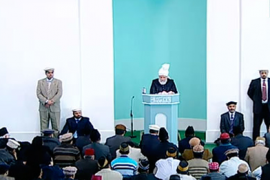 I would also mention that the Holy Prophet (sa) used to take care of the spiritual development of his guests. Hence, in one narration we read that after feeding the received guests he sent them to sleep in the mosque, as was their desire. Then he woke them all up for the morning-prayer. Therefore, the department of Tarbiyyat during Jalsa has also been set up in order to remind guests of the prayers and to wake them all up for the Fajr and Tahajjud prayers, but gently and affectionately. May Allah the Almighty enable all the workers to serve the guests of the Promised Messiah (as) in the best manner. After the prayer I will lead two funeral prayers in absentia. The first is of Mr Sayyed Muhammad Ahmad Sahib, son of Hadrat Dr Mir Muhammad Ismail, who passed away in Lahore, the age of around 92 on 13th July. Inna lillahi wa inna ilaihi rajioon. He was the eldest son of Dr Mir Muhammad Ismail and in this way Hadrat Ummul Mu’mineen Ammaan Jan [blessed wife of the Promised Messiah] was his paternal aunt. He was married to the youngest daughter of Hadrat Mirza Bashir Ahmad. In this way he was his youngest son-in-law. Hadrat Dr Mir Muhammad Ismail married twice. The first was to Hadrat Shaukat Sultan Sahiba in 1906. They had no offspring. The second was to Amatul Latif begum Sahiba in 1917, daughter of Hadrat Mirza Muhammad Shafi’ Sahib Dehlwi, the auditor of Sadr Anjuman Ahmadiyya. Of her, by the grace of God, 7 daughters and 3 sons were born. Huzoor related two faith-inspiring incidences from the history of Ahmadiyyat in which he was involved in. He was a very pious person that was devoted to his prayers. May Allah the Almighty elevate his status and have mercy on him. May He enable his children to continue his virtuous deeds. The second funeral is of Mrs Mahmooda Begum Sahiba, wife of Chaudhry Muhammad Siddique Sahib Bhatti. She is the mother of Asghar Ali Bhatti Sahib, who is a missionary serving in Niger. She passed away on 16th July at the age of 73, to Allah we belong and to Him shall we return. The deceased was a Mossia [part of the institution of Al-Wasiyyat] and aside from her husband, she is survived by two daughters and six sons. May Allah grant her children the opportunity to continue her good deeds.